Thank you gym teacher extraordinaire Mr. Spiers! So proud and appreciative of your leadership, and thank you to Pembina Trails School Divison for use of your space and opening it up to the neighbourhood! BRAVO! I am very pleased to provide funding support for tubes/chains/etc., and snacks at the May 8th and June 12th clinics (6 to 8 p.m.) I will be attending full of ‘hot air’ and will be filling bike tires and handing out FREE City of Winnipeg Bike Maps (see Online Bike Map). Check out 2018 Sidewalk and Pathway construction in South Winnipeg and entire city. South Winnipeg has THE best connected trail network in Winnipeg! When Aryan Saini’s younger sister complained her bike’s brakes were failing, the 14-year-old from South Pointe didn’t hesitate to get her ride into the shop. Saini, a Grade 8 student at École South Pointe School, didn’t have to take the green and purple two-wheeler far either; rather, he just rolled it into the gym on his lunch hour. Kanishka Upadhyay tunes up her bike at South Pointe School on her lunch hour. 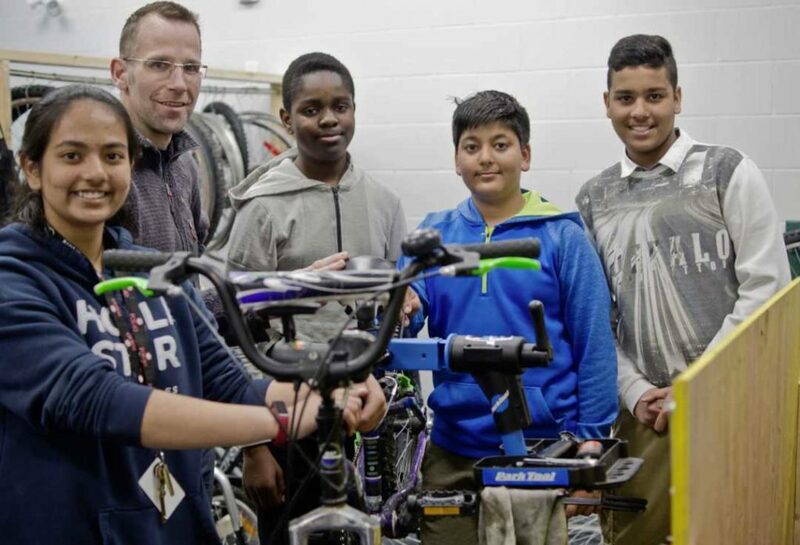 Saini is one of dozens of students who benefit from the school’s extra curricular bike lab run by phys-ed and practical arts teacher Dan Spiers. 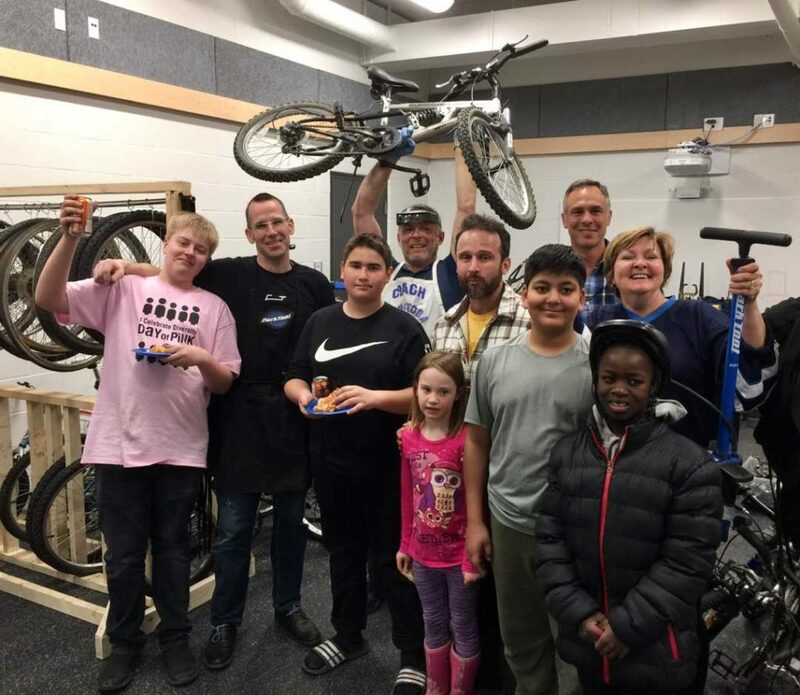 The weekly bike club teaches kids how to perform basic maintenance and repairs on all makes and models of bikes and is complemented by an elective course that covers bike mechanics, safety, and culture. Though Saini said he had some experience working on bikes with his cousin in the past, he admitted making the needed brake adjustment for his sister wouldn’t have been a priority without his involvement in the club and access to its tools and parts. Since South Pointe opened in 2017, the bike lab has been a fixture at the school with about 100 students riding to class each day. The club and course run out of multi-use area (originally conceived to be a fitness centre) connected to the gymnasium and is outfitted with four workstations built by Spiers, bike storage, and parts bins. Spiers’ first bike lab opened at École Viscount Alexander School four years ago when he was a teacher in Fort Garry. The program started organically, with students asking Spiers for a hand with minor bike repairs, and gained traction when Spiers brought the idea for a club to the administration as a sort of community outreach. Aryan Saini makes adjustments to his younger sister’s bike in the South Pointe bike lab. “Sometimes there’s opportunities in the winter to do food drives, around Christmastime for example, or maybe there are some elderly folks in the area, and we can take students out to help clear their driveway,” Spiers said. A bike club held the same potential, Spiers contended, and would help students understand the needs of the community. “We can give back to newcomers to Canada, we can give to less privileged students and families in the community and actually provide them bicycles, and that’s the step that got the school’s attention,” he said. At South Pointe, much of the same principles apply: bikes and parts are salvaged from the Brady landfill through the Winnipeg Repair Education and Cycling Hub program; students can build bikes from the parts to take home or donate; and the community is welcomed into the space in the spring to access the lab. Spiers is also emphasizing the importance of reusing and recycling materials with his students. Rather than junking a bike (or pen, or toaster, or a zipper) and heading to the store to buy a new one, if something goes wrong, he is encouraging kids to get creative, find solutions, or imagine something new. “When you look at the idea of fossil fuels and how we’re trying to get away from that sort of thing, I want the kids to not think about what they can buy, I want them to think about what can I build and make,” Spiers said. “And when something breaks, I don’t want them to think, OK this is garbage and needs to be thrown away. I want them to realize that we can fix this. The South Pointe bike lab will be holding open houses on May 8 and June 12 from 6 to 8 p.m. where volunteer bike mechanics and students will be offering free minor bike repairs and tune ups for people in the community. Any bikes needing major repairs or large parts will be referred to a local shop, Spiers noted.